Fat Bruce Lee (on a diet) and I found that our cheeseburger levels were dangerously low. We tossed a coin to choose between Rush Street and Ford's Filling Station--both in Culver City--and each visible from the front door of the other. Ford's Filling Station came out on top. Free public parking was available within a few blocks, and we walked into a relatively empty establishment at noon on a Tuesday. We ordered a couple of Pub Burgers at $12 each--$3.00 extra for some bacon (on the side) and Cheddar. The Beef: 100% Angus Chuck. Keep in mind that Ford's Filling Station is a gastropub, so when I was told that I was getting 12 buck Chuck, I was less than impressed. We were informed that they ground the beef on the premises. Why bother? It struck me that if they were charging $12 for a burger, and they had their own grinding apparatus, then they could have added some interesting/flavorful cuts to the blend to deliver some bang for the buck and some flavor to their diners. The beef was mildly beefy; it tasted mildly of aging; it was juicy enough, but it just lacked any sort of oomph. 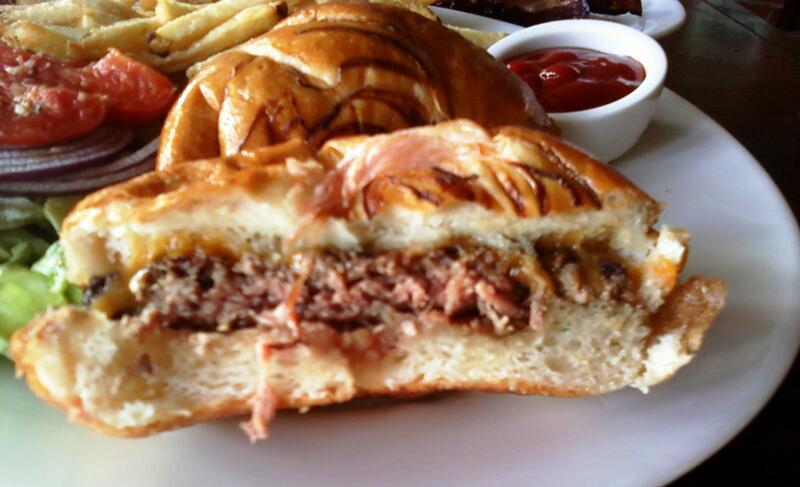 The beef was formerly sourced from Niman Ranch, but that was no longer touted on the menu. The beef was fine. The Sear: The sear was EXCELLENT. It was crusty, dark, and even. This was the highlight of the burger. It provided a welcome shift in texture and savory flavors. The Seasoning: They dusted the exterior with a pepper-skewed blend. It was competent and not over-applied. The seasoning was fine. The Preparation: They griddled the hell out of those patties on a nuclear explosion of a flat top. This imparted a tremendous sear. 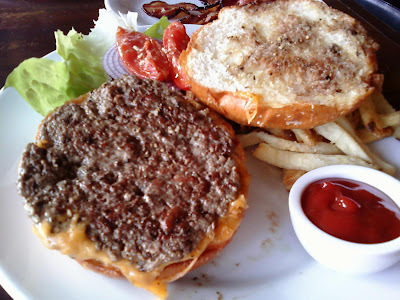 In spite of the intense heat, they cooked the burgers to a perfect and pretty juicy Medium, as requested. They ground the Chuck to Medium Coarse. The hand-formed patties were packed loosely, so the bite was tender. The patties were around 7 ounces. The Cheese: They used a mild Cheddar, which served no purpose but to add fat to the dish. The Cheddar was completely uninteresting in terms of texture and flavor--its absence would not have been noted. The Bun: I was informed that the brioche bun came from Bread LA. Not that the purveyor of the buns mattered. The bun was the low point of the meal.. The top of the bun had been slathered in oil...unpleasant. This mildly sweet and chewy bun had thin strips of red onion baked into it to form a pattern. While this was visually appealing, I could have done without the onions in my burger. Also, the bun was a big, bready monster. The Meat To Bun Ratio: This was tragically skewed in favor of the bun. Only by removing the bottom bun and flipping the whole works over were we able to actually taste the mild beef. The Fries: The fries were fine. They were flat cut, skinny, peel on, and properly seasoned. They were crisp and fried in a neutrally flavored and very hot oil. The Toppings: The tomato wedges that came with the cheeseburgers were the nod to the "gastro" in "gastropub." These were soaked in olive oil and dressed with fresh garlic. The bacon...dear gawd....the bacon. Apple wood smoked pork candy! This bacon currently tops the list of things that I want to eat just before I die. The bacon was a phenomenal side dish. The Value: $15 bucks for Chuck, weak Cheddar, and a massive oniony bun. No! The value was poor for a burger, which was merely fine. 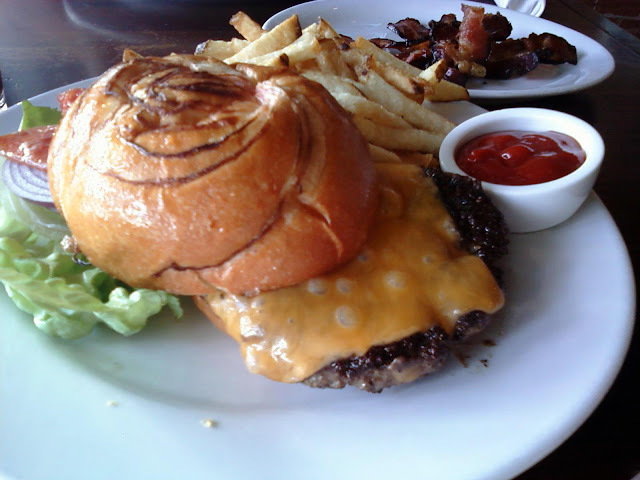 Now, one of the worst burgers in LA, Father's Office, is in the area, so the bar has been set pretty low in Culver City for quality burgers. That said, for 12 bucks, surely they could have done better than Chuck.....just sayin'. Burger Review : I expected a little more from Ford's Filling Station...what I got was a fairly average burger for a premium price. Damn good bacon, though.